U-News has reached out to YAF for comment. This story will be updated as more information is made available. After setting up their table, YAF members complained to the school that other students were harassing them for supporting hate speech. The university was aware of the group’s plans to table, but was not told about the sign in advance. While the Missouri Campus Free Expression Act protects students’ right to free expression on campus, students and student organizations are held to a higher standard than members of the general public. According to the University of Missouri Student Standards of Conduct, students are prohibited from engaging in harassment, bullying, retaliation and discrimination. The Campus Expression Act also prevents school personnel from imposing restrictions on individuals or organizations engaged in expressive activities based on the content or viewpoint being expressed. Many UMKC community members expressed outrage at YAF, criticizing the group for promoting hate speech in the wake of last week’s hate-filled terror attack in New Zealand, which left at least 50 people dead and dozens more injured. The group received strong backlash on social media, with students calling the group out for inciting controversy and fostering intolerance on campus. What a load of horse manure. YAF was not contacted in advance, most students supported the idea and sign, nobody linked it to an unrelated mentally ill shooter in another country, and the idea that Seth being extremely polite and engaging others in friendly discussion is ‘bullying or harassment’ is laughable. UMKC itself sends out stuff that offends me, as do student orgs. Do I have a right not to be subjectively offended? No. Had UNews even bothered to show up, or Mr Martello actually bothered to come speak to or even reach out to if group – he did not, he may not have had such a ignorant statement and opinion. I am glad groups like YAF have the courage to say what the supreme court and the Missouri constitution both say: free speech is protected and preserved on campus and according to a quote from the supreme court decision author on the recent supreme court decision in Matal vs Tam, just as in countless previous decisions going back decades, ‘speech that demeans on basis of race, gender… Is hateful; but the proudest coast of our free speech jurisprudence is that we protect the freedom to express ‘the thought that we hate” the supremecourt.gov website says the supreme court unanimously reaffirmed there is no ‘hate speech’ exception to the first amendment. This article is extremely misinformed and UMKC’s lack of box backbone or understanding of our constitution is laughable. The only students fostering hate and intolerance were the students harassing the YAF students. This article is ludicrous for several reasons, the most prominent being that YAF’s sign proclaiming hate speech is constitutionally protected free speech by no means alludes to “supporting” or even endorsing “hate speech.” A common misconception, especially among American youths, is that hate speech may be restricted or silenced when it offends people. To clarify, there is no such thing as “hate speech” – rather, the term was conceptualized to define speech that the listener found offensive or incoherent with their own personal beliefs but the term lacks basis in any First Amendment jurisprudence. Additionally, the fact that a distinguished position at this University can be so misguided, and frankly uninformed, about Constitutional safeguards is appalling. In what way does clarifying a wide-spread misconception warrant “strong reactions because of the provocative nature” of that speech? 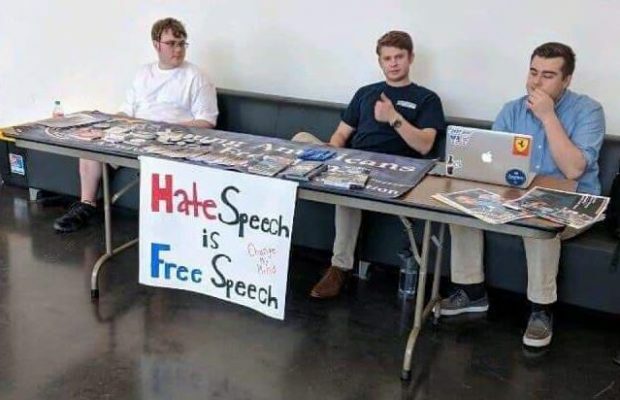 There is nothing provocative about the sign that the YAF decided to display: hate speech is free speech. That is not controversial, it is factual. Moreover, in their message, the YAF opted not to display a message containing any form hate speech which someone could find offensive. Instead, they chose a sign to inform the student body that speech is protected regardless of how they wish to convey it – a fact well-known to most. And on the off chance that someone was offended by the YAF’s constitutionally protected message, offense alone does not warrant restriction or censorship, let alone harassment and ill treatment. That something like this can occur on the UMKC campus shows the mass confusion and utter lack of knowledge about fundamental rights. It is through interactive discussions and disseminated information – like the YAF’s sign – that help to inform and correct these misconceptions. And that such attempts are thwarted by abhorrent acts is unconscionable and a disgrace to University. Higher education is designed to be an forum where diverse views may be openly expressed and students are free to discern their own beliefs and ideals, even when those views offend our moral sensibility. Such intellectual growth is impossible when a particular segment of the student population are restricted, silenced, or persecuted. As a University, we owe it to ourselves to be better and not tolerate such wrongs. I, for one, am ashamed that such behavior occurred on our campus.